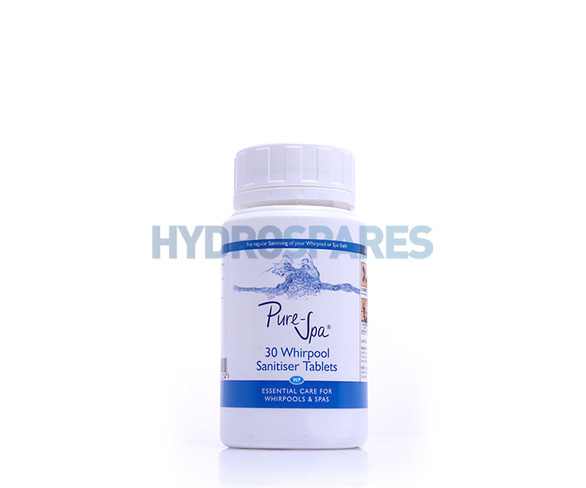 For regular sanitising treatment of your Whirlpool or Spa bath. For a fresher more hygienic system. Use after each use of the bath. These small, white tablets are based on dry chlorine donor, sodium dichloroisocyanurate (NaDCC) which is blended with effervescent components before being compressed into tablet form. The result is a fast-dissolving, highly convenient, safer and more accurate alternative to liquid bleach. Disinfecting solutions prepared from Pure-Spa Sanitising Tablets containing NaDCC are fast acting and have a complete spectrum of biocidal activity. Bacteria, bacterial spores, algae, fungi, protozoa and viruses are all sensitive to their effects. The problem of corrosion associated with liquid bleach has often resulted in the use of more expensive and less effective alternatives. It has been demonstrated that chlorine solutions produced using NaDCC tablets are in general significantly less corrosive. Caution: Solution may bleach fabrics. Irritating to eyes and respiratory system. Contact with acid liberates toxic gases. In case of explosion do not breathe fumes. The warnings & the hazard symbols on the pack are designed to refer to the entire pot of tablets, not neccessarily to one tablet that is dissolved in a bath full of water (approx 150L). I use every time I use my spar bath, after another companies product let me down, and black bits appeared, as of yet, they haven’t come back. Used in conjunction with Power Tab and Wirlpool Care Kit. An excellent product. We have been using these tablets ever since we got our whirlpool bath about 6 years ago.They do an excellent job of keeping the bath nice & clean and fresh smelling. For a periodic deep clean we also use the Pure-Spa Whirlpool Cleaner & Degreaser - this also does a fantastic job of cleaning out the pipes and pump etc. Great product which really does do the job. Nice to know that it doesn't cause problems with our septic tank. Whirlpool Sanitising tablets are very easy to use and leaves my spa bath lovely and clean. Have been using this product for over a year now. Thanks. We had dreadful problems with black specks in the water until we started using these tablets, together with the Degreaser used occasionally the water is crystal clear.. The delivery was very prompt as expected. The sanitising tablets provide a high level of confidence that you are properly cleaning the bath and all of the unseen pipework. Highly recommended. Excellent product keeps the bath fresh and gives you the satisfaction that it is sanitized. First time I have used this product and I can honestly say I was very Impressed. I would certainly recommend this product. Simple to use, great smelling bath afterwards. Keeps the system fresh and clean. Have used these tablets for the last four years and have never had a problem with my bath. Excellant product. My first use of these tablets. Very impressed. Effective cleaning and leaves spa smelling fresh. Will still use the Cleaner/Degreaser occasionally but these are so much more convenient and less wasteful on water. Highly recommend these cleaning tablets. We had terrible issues which we've managed to completely eradicate with a combination of the deep cleaning puck, degreasing solution and these tablets for maintenance. A real find - thanks so much! Delighted to advise that the remaining 2 packs of tablets arrived today - thanks I am sure to your efficiency! Great service all round and happy to recommend you guys. It almost makes me want to start cleaning my bath. Great Tablets. Have used them before and they work a treat. Oh yeah, faubouls stuff there you!